Your ability to steer and control the speed of a several-ton hunk of metal on a paved surface with other motorists, pedestrians and traffic signals to watch out for is something you likely take for granted. After all, you probably get behind the wheel every day to run errands, go to work and chauffeur your kids around town. You might not realize it, but driving requires your maximum attention to be done safely. It’s scary to think how prevalent driving distractions are today, especially when you consider that 80 percent of crashes and 65 percent of near-accidents occur due to distractions, states a study released by the National Highway Traffic Safety Administration (NHTSA) and the Virginia Tech Transportation Institute (VTTI). Visual: When you take your eyes off the road. Cognitive: When you take your mind off the task of driving. Manual: When you take your hands off the steering wheel. All driving distractions fit into one or more of these categories. Daydreaming: When you drive a route you take every day, it’s easy to “zone out” and forget to pay attention. This cognitive distraction is the most common among motorists. Music: What’s a commute to work without some tunes? Drivers are visually and manually distracted when they change the radio station, put in a new CD or flick through songs on an iPod. Eating and drinking: This visual and manual distraction can make it difficult to execute split-second decisions, which can lead to an accident. About half of motorists admit their driving has been compromised by eating or drinking. 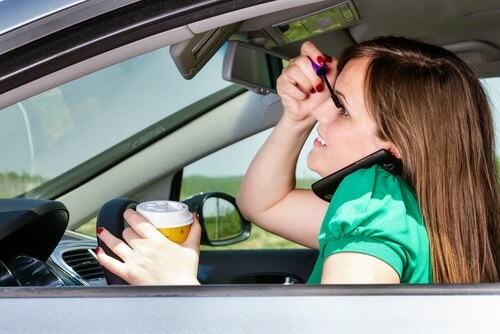 Talking on the phone: Despite the known dangers and citations given for talking on a phone while driving, almost a quarter of motorists do it. Holding a cell phone is a manual distraction, but even having a serious conversation with a hands-free system is cognitively distracting. Rubber necking: Everyone is annoyed when other people do it, but more than one-fifth of drivers admit to craning their necks to look at an accident on the side of the road. This visual distraction slows traffic and can lead to an accident. Turning your head to look at a construction site, scenic view or billboard is also a dangerous distraction. Texting: Here’s the distraction everyone always talks about. At the time the survey was taken, 16 percent of respondents admitted to texting while driving. This distracts motorists visually and manually. Dealing with other vehicle occupants: Every parent knows what it’s like to struggle with a crying child in the back seat while driving. Unrestrained pets can also be a dangerous manual and visual distraction. Even a friend in the passenger seat can become a cognitive distraction. Dozing: While less likely to happen around town, a boring cruise-controlled drive on a semi-deserted interstate can definitely bring on drowsiness. Five percent of drivers have admitted to dozing off behind the wheel, causing visual and cognitive impairment. If you find yourself becoming fatigued during a long drive, don’t hesitate to pull over and rest for a few hours. Putting on makeup: On rushed mornings, some women resort to applying makeup on the way to work. This visual and manual impairment obviously has the potential to be very dangerous. Updating social media: Some drivers are tempted to report things they saw on the road without delay, updating Facebook statuses and Tweeting while behind the wheel. It’s exciting to get the word out about something funny or astounding, but it can wait until the car is parked. Aside from avoiding distractions, taking good care of your car is also important to prevent accidents. The next time your car needs a tune-up or repair, stop by Scott’s Fort Collins Auto & Repair for professional automotive services. You can also schedule an appointment online or call ahead at (970) 682-4202.